Entrepreneurship is vital for companies’ success, to allow them to adapt and grow in today’s interlinked and turbulent business environments. Yet as they grow in size and complexity, many companies become less innovative and more rigid. The challenge of how to deal with these trends has led to the rise of the field of Corporate Entrepreneurship, looking at the development of new business ideas and opportunities within established firms. 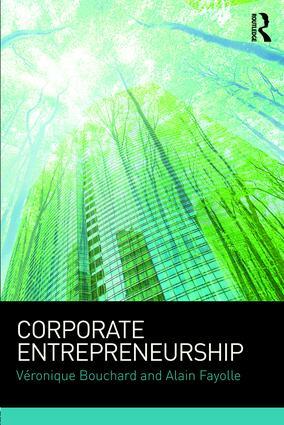 This book provides an effective entry point to Corporate Entrepreneurship as an academic field and a management practice. Corporate Entrepreneurship leads readers through an overview of real-life Corporate Entrepreneurship; the aims, organisational models, implementation and results. Covering theoretical perspectives, empirical findings and practical concerns, the book also switches between the perspective of the individual and the organisation. Written by two specialists of the discipline, the book includes a wealth of real-life case studies, covering over three decades of Corporate Entrepreneurship practices, by companies of all sizes, geographies and sectors. With coverage of such topics as Internal Corporate Venturing and Participative Innovation, this thoughtful text will be required reading for entrepreneurship students around the world. Corporate Entrepreneurship: a specific process?